Are you looking for vegan snacks for your kid’s lunch box or for afternoon snack cravings? Then look no further! We’ve got you covered with 20 delicious and easy vegan snacks for the whole family! Who doesn’t love a good snack in the afternoon? But snacks don’t necessarily have to be loaded with tons of sugar and fat! These 20 easy vegan snack ideas are the perfect proof! Healthy and delicious vegan snacking has never been this easy! I’m sure we’ve got something for every taste and every occasion! So let’s get started with these healthy vegan snacks! These roasted chickpeas make such a delicious and healthy snack! They’re perfectly seasoned, a bit spicy, and super easy to prepare. They’re perfect for parties, snacking in front of the TV, road trips, and so much more! Don’t these vegan mozzarella sticks by Jasmine and Chris from Sweet Simple Vegan look amazing? They’re soft and melty on the inside and crunchy on the outside. Perfect for your next party! This vegan cookie dough dip makes the perfect afternoon treat! It’s not only super delicious, but also incredibly healthy and packed with protein. Guilt-free snacking so to say! And it’s ready in just 5 minutes! If you’re looking for a vegan version of Cheez-It crackers, you should try these vegan cheese crackers by Andrew and Larisha. They’re perfect for your kids’ lunchbox or as a salty afternoon snack! You are going to love these vegan onion rings! They are incredibly easy to make, crispy, and delicious. Plus, they are oven-baked, which makes them so much healthier than fried onion rings! These coconut and peanut butter spiced energy bites by Anna from Anna Banana make the perfect snack! And the best thing is that they take less than 15 minutes to make. This vegan spinach dip with artichokes is one of my all-time favorite dips! It’s so rich and incredibly creamy. Serve it with whole wheat sesame crackers and you’re good to go for your next party! I absolutely LOVE pretzels and these vegan pretzel garlic knots by Bianca from Elephantastic Vegan look amazing! Serve them with vegan cheese sauce or smoky tomato dip if you’re looking for more of a pretzel pizza flavor. You’re gonna love these vegan chicken nuggets made with chickpeas and a crispy cornflakes crust! They’re super easy to make, pretty healthy, and SOOO delicious. Vegan comfort food at its best! This is what I call drool-worthy popcorn! This caramel chocolate vegan popcorn by Mel from A Virtual Vegan looks utterly delicious, doesn’t it? Energy bites just make the perfect snack. These little blueberry bites by Natalie from Feasting On Fruit are like mini blueberry muffins. They’re unbaked but still fluffy like muffins. And they’re healthy too! This easy baba ganoush makes such a delicious and healthy dip or appetizer. It’s great with pita, flatbread, or as a side dish to falafel and tabouleh. And the recipe couldn’t be much easier! These vegan and gluten-free no-bake peanut butter balls by Alison from Loving It Vegan make a great snack or dessert. The best thing is that the peanut butter balls are smothered in chocolate! Have you ever tried making your own crackers at home? With only a few ingredients, you can make these delicious Za’atar crackers by Bianca from Elephantastic Vegan! This vegan ranch is not only super creamy and tangy but also incredibly easy to make. It’s great as a dip with veggie sticks, cauliflower wings, or as a salad dressing. And it’s ready in less than 5 minutes! Of course we also need vegan granola bars in this roundup of vegan snacks! These granola bars by Brandi from The Vegan 8 are vegan, gluten-free, and oil-free, so they’re perfect for kids with allergies. Another classic vegan snack recipe! These goldfish crackers by Rebecca from Strength and Sunshine are not only vegan but also gluten-free! These vegan baked mac and cheese balls by Sophia from Veggies Don’t Bite are the perfect comfort food! They make a delicious vegan snack or appetizer. And can you believe you can find some hidden veggies in these crispy cheesy balls? If you’re a fan of spicy food, you should try this spicy Mexican hummus by Linda from Veganosity. It combines traditional hummus with chili powder, cumin, garlic, and jalapeño. Serve it with tortilla chips for a delicious vegan snack! Wow! Look at the color of this pea hummus by Kate from Veggie Desserts. It’s super easy to make and full of flavor. All you need is 5 minutes and 5 ingredients! I hope you enjoy these vegan snacks as much as I do! 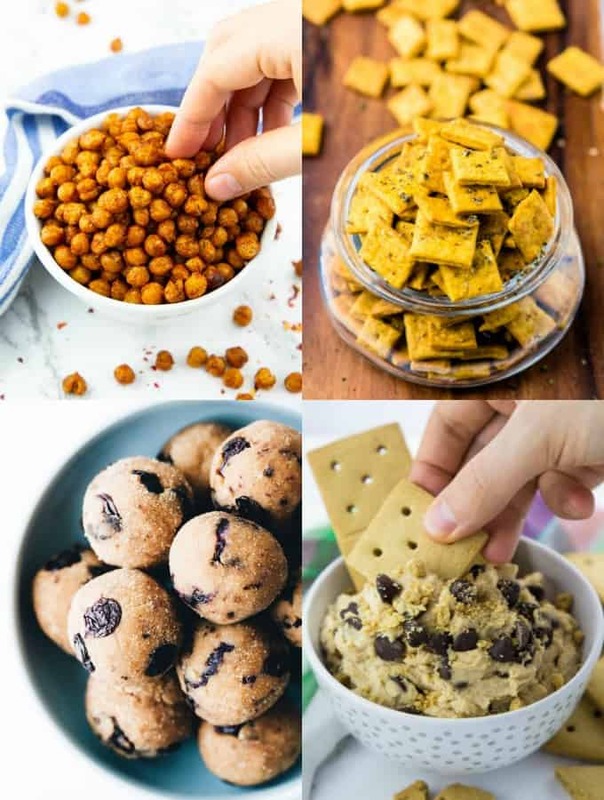 Don’t forget to pin or share this post so you have these vegan snack recipes ready when you need them! If you give any of these vegan snacks a try, I’d love to know what you think about it. What do you think are the best vegan snacks? Just leave me a comment below. Your comments really make my day!